April showers...bring the trench coat out. So April is off to a messy start. Rain, cold and some parts of the North East got sleet and snow. Okay maybe not total trench coat season, but I'm in serious need of a trench coat update. I've had my classic trench coat for a few years now but I'm ready to shake up the classic look. I'm seriously kicking myself for not buying this J.Crew jacket when I saw it, of course now that most of the sizes are all sold out. I adore it in the fiery sunset color, it's such a stand out color. 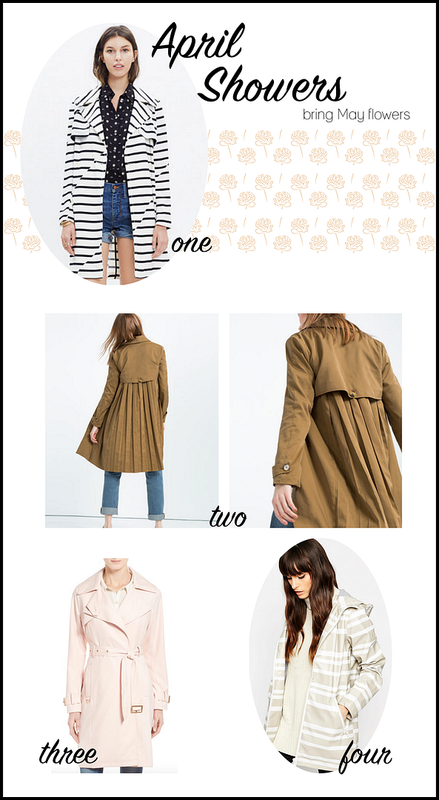 And not that I need anymore items from Madewell but I'm loving their fun take on a trench coat with a stripe print. Since it's Spring after all, how can you not love a pastel piece like the French Connection trench. And April does brings showers, so maybe a jacket with a hood like ASOS raincoat would make sense.